Everyone believes there are enough votes to pass the 2040 Comprehensive Plan. This is good news, and the changes that the councilmembers appear to be teeing up look positive as well. The 2040 plan doesn't go as far as it could, and it's not as if the entire city is going to change overnight. It's a good plan that allows for smart, incremental growth in Minneapolis. But we shouldn't lose sight of this achievement should it occur, no similar city in the United States has yet passed a plan like this. A similar plan went down in flames in Austin earlier this year. It takes a tremendous amount of effort and political courage to get something like this through. So call me a nerd but on a whim over my lunch today, I decided to use the dimensions of an average older Minneapolis home (used 30'-0" x 60'-0") and do the first layout I thought of that would fill the space with a triplex. 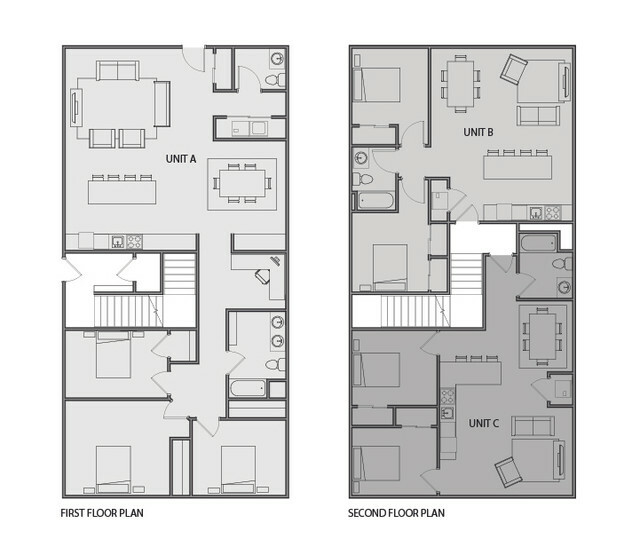 Unit A - 1530 sf - 3 Bed / 1 Bath with giant living space. Unit B - 784 sf - 2 Bed / 1 Bath - modest living space. Unit C - 765 sf - 2 Bed / 1 Bath - modest living space. I guess I did this out of frustration at all the backlash at the triplex/fourplex proposal. At 2 stories, this can clearly look like a single family home from the outside - one front door and a side entrance. Triplex is better than no-plex. I think some very nice homes will come of this. I'd disagree that a 30'x60' house is average. That's a beast! For comparison, my nicely sized 1912 house is about 1200sf finished over two floors -- your layout is three times that size. I went to the Wedge and used google maps to measure a couple. Maybe they're duplexes haha - you're right it's bigger than typical. Good news, is it would fit. Edit: yup definitely some duplex roofs. Well here's a third unit. Yeah, that’d be about a 3500 sq. ft. single family home, which is probably average to somewhat below average for a teardown in Linden Hills. We got a judge delay. Deep breaths. Yes, I saw that this morning. I don't see that it'll make much difference...unless there's some angle to this I haven't considered. I'm confused why he blocked the vote; I feel like there's no reason he can't review or require modifications to the plan after they vote on it or even after they submit it to the Met Council. And obviously there are more reviews and analyses that will happen once the Council get their hands on it. Incidentally, this group's bad-faith efforts to claim "environmental damage" follow the same super narrow line of reasoning that I'm familiar with from briefly living in California. Some of these groups like the SF Sierra Club almost literally can't see the forest for the trees. I would love if our environmental laws and reviews one day had to account for the damage done by inaction. My eyes rolled so hard when I saw it. Hope this too is tossed out in a flash. I've not seen the briefing, and you really cannot rely on general news reporting on anything legal (or otherwise technical, I assume), but all I've got is that the plaintiffs may be arguing that the environmental review they want is a required process step that has to happen for a vote, thus if the vote happens without it, they've already lost what they are entitled to get. This makes little sense to me as regardless of whether it's voted on today, they judge can enjoin any implementation of it tomorrow or next week or whatever. Regardless, press reports sounds like the judge was only taking this time to decide how to rule, not actually issuing a TRO because he felt it justified. As I said, I haven't seen the filings and I know nothing about this area, but I'm still guessing that he will decide against a TRO on at least the lack of harm and likelihood of success factors. Looks like the TRO was denied. Great news to wake up to! Nice to see the frauds who use the language of environmentalism or social justice to bolster their conservative views get a small comeuppance. Minneapolis 2040 approved 12-1, with the only dissenting vote coming from Linea. What a masterful bit of legislating by Lisa Bender (I assume). I would have pegged Goodman as a sure no vote (and yeah, there were compromises in her ward I don't love). There were some questioning noises from just about every CM (though I do not personally recall Cano saying anything at all). Just a great job of holding things together. Basically casts shade at everything in ways we’ve come to see from the Red Sign Brigade at Minneapolis for Everyone (Already Here).